Music instrument institution Swee Lee is a homegrown brand that began their humble operations in 1946 by supplying brass and woodwind instruments to the British military band. Today, Swee Lee owns several showrooms and lifestyle stores that can be found all over Singapore and they offer a range of contemporary musical instruments such as drums and guitars. Their flagship store at The Star Vista recently underwent renovation works and the original store has expanded to cater for a new retail space that stores just about everything a musician will ever need. Expect to be greeted by musical instruments, audio and DJ equipment, fashion apparels, a music academy and the best part for coffee enthusiasts—an in-house cafe called Swee Lee Social Club. Upon first look, the cosy cafe immediately appealed to us with its intimate setting that allows for heartfelt conversations with your friends over coffee, yet with enough space for patrons to walk around comfortably. In addition to their stellar brews, Swee Lee Social Club also carries juices and bottled drinks that are kept in a chiller. Boasting an aromatic selection of freshly brewed coffee brewed with beans that are roasted by local speciality coffee roaster Common Man Coffee Roasters and various types of tea, Swee Lee Social Club is the latest hangout spot in the west that you should know about. Be sure to approach the baristas behind the bar for the secret menu that features some light bites and smoothie options. Swee Lee Social Club’s secret menu is concise and there were only 5 items on it—a small selection of smoothies and some sweet offerings. If you are ever craving for something sweet, their Waffle & Co (S$10) off the secret menu will do the trick. 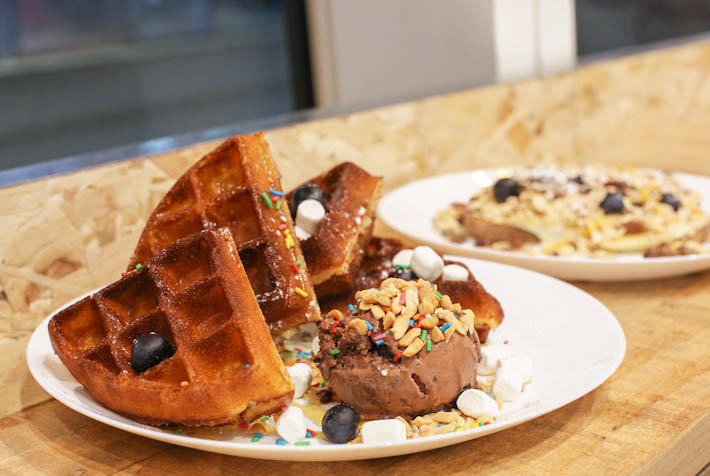 It comprises a crispy buttermilk waffle topped with a scoop of ice cream as well as a myriad of sprinkles from rainbow rice to crushed peanuts. Simple as it was, this waffle dish is bound to satisfy those with a sweet tooth—no doubts about that. For something a little more filling, diners can opt for the Sweet Toast (S$7) that features fresh blueberries, bananas, muesli, honey and dried fruit scattered over a toasted piece of sourdough toast. Despite the dish having lots of interesting textures, we felt that the dish was lacking a certain wow factor. It was literally just a variety of fruits scattered over bread which basically anyone could whip up at home. Overall, we would say that although the food was not the most fantastic around, we still give props to Swee Lee for adopting such a refreshing concept to revitalise what used to be a plain old music instrument store.